Well, I've been putting it off, but my tires are quickly turning into Baldinis. Anyone have a recommendation on tires? I want a set that will last, I have a decent commute, 50 miles each way and I drive in all sorts of weather conditions.. dry, wet, ice, snow. I'm looking for something good all around.. gas mileage, performance, road noise, etc. p7 have been my recent favs because cheaper than the continental extreme contacts. guarantee feeling secure at speed in even heavy rain. well worth the price for either tire. p7 legit lasted me 70K as well which is good because i hate buying tires every 2 years. i researched michelin and they are good but they dont seem to have as long a life. I really like my bf goodrich advantage t/a sports. we've had them on two cars and they do great in the snow and rain with a 60 or 65k mile warranty. Cannot give a recommendation for snow, but just put a set of pirelli p4 four season plus on our 2012. Not driven the car enough yet with them to give any feedback but so far they do ride nice. If you are a sams club member and are interested in the pirelli's, they have a great deal going on right now and think the same deal goes for the p7's. Their price was already lower than anywhere else I checked, but then they took off another $80 on a set of four and another $15 off per tire with getting the premium tire installation making the total $140 off. Was $472 out the door for the new set mounted. Had been running uniroyal tiger paw touring a/s tires and they did really well in wet and no issues with them on ice. Last set had over 70,000 miles on them. I would have put them on again, but walmart screwed up big time. I run the Goodyear RS-A police tire. I get excellent performance; wear, handling, and ride. Except for my performance car, this tire is what I've been using since 2005 on my daily drivers...2 Crown Victorias with the police package and a Chevrolet Impala with the police package. One thing to note though, they will get a tad noisy when they get close to wearing out. My performance car has the Pirelli P Zero Nero A/S, which does great on dry road. I can't give any advice about other weather conditions as I drive this car only in the sunshine...no rain, snow, or ice. I will soon be in the market for a set of 18" for the wife's car. had some 2yo Generals and this winter she wasn't happy then split one on a pothole. Had the local tire shop throw whatever they could get cheap while I research. I am thinking all season with a lean towards snow performance. How were the Generals? I hear my local store shop has a rebate on them right now. I believe they were the General Altimax she liked them last winter but not this winter. This was a bad winter near Green Bay though. We took the car to NJ when the tires were 1yo and I was happy with them in some BAD weather. Interstate 80 closed one night right after we exited, daughter said she "wanted to see the bottom of more semis" ugly weather. Ok, First of all I am not promoting Tire Rack.com over any other tire merchant. 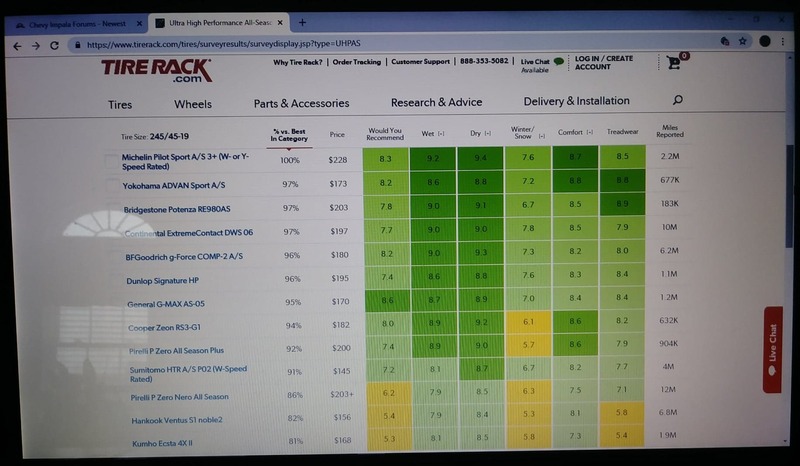 I am just showing a tool I use to make my decision when buying tires. What I like is it gives you a comparison of wet and dry traction, snow and ice, treadwear, comfort, ect. For me personally, I like the BF Goodrich g-force Comp 2 A/S. Had a set on my 2012 Impala LTZ and loved them. Good price and great handling in all weather conditions (North/Mid-Tennessee). I have a set on my wifes mini-van and they really have made it feel more in touch with road. Much better than whatever the crap factory tire was by far. Plus the BFG is an aggressive looking tire which I also like. OK, enough of my opinion as I have digressed from my original intent for this post. Do your homework (which is why you asked the question here in the first place I believe) and hopefully you will find this tool useful for your tire needs. Knowledge is power!